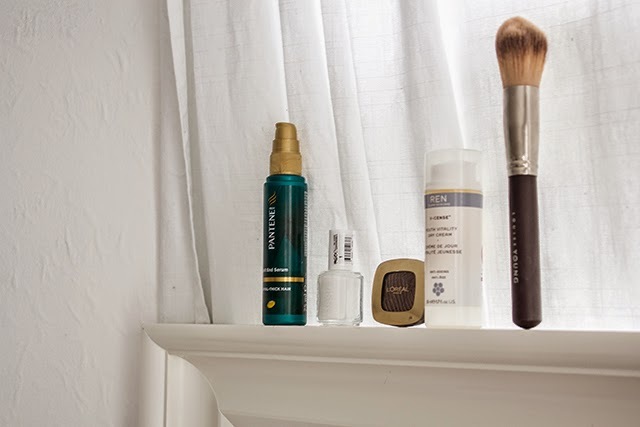 This month beauty favourites have been inspired mostly by bloggers. If you don't follow me on twitter or instagram you won't know that I recently had a hair cut. The hairdresser chopped of around 10cm of my long hair, so now they are a medium length hair. They are a lot of more healthier and thicker. I had recently re-ombred it, the Pantene Split End Serum is just amazing! Leaves my hair feeling smooth and less frizzy, as well as it's smells so nice. I been obsessed with Kate blog, she wears white nail polish and it's looks so pretty! I loved white nail polish on my toes since I've been back from Malta. I recently had fallen in love with it on my hands too. The Essie Nail Polish in Blanc is just beautiful! The only white I found easy to apply without the streaky lines and need of 10 coats. I love watching youtube videos while apply my make-up, I been watching Barbara a lot recently, she have spoken about this lovely single L'Oreal eye shadows ( she had a different shade, than I do) so I have picked up one in colour Lumiere, it's bring out blue tones in my eye so nicely. They eye shadow has a very creamy and smooth formula. I think I will be picking up the other shades too. I am working on my skincare, I always wanted to try out products from Ren. The Ren V-Cense Youth Vitality Day Cream seem to be perfect for a day cream. Starting to use Anti-Aging cream is never to early. Louise Young Foundation Brush is just perfect, it's all Anna fault. I just love it, it's so amazing. Have any of you had a chance to try it out? I've been looking for the perfect white polish that doesn't take too many coats (despite having about six in my collection already!) I love Essie so I might have to give this a go! I also picked up the Louise Young brush this week after lusting over it for an age!